Did you ring in the holidays with a brand new ring? We know lots of couples get engaged around the holidays. After all of the celebrations and engagement announcements, it’s time for the real fun to start … planning your dream honeymoon! If you’re looking for the best all inclusive adults only honeymoon resorts — without having to travel halfway around the world to get there — this list is for you. Craving that Tahiti-style over the water bungalow luxury … but without the 18-hour flight it takes to get there? Then book a stay at Sandals Royal Caribbean! This luxury all inclusive resort is one of our top 10 most romantic all inclusive resorts and has recently introduced over-the-water bungalows to take romance in Jamaica to a whole new level. Laze the day away in private infinity pools and hammocks that hang right over the water’s edge. And since you’re on your honeymoon, you shouldn’t have to lift a single finger — so you’ll be glad to know each of these luxurious bungalows comes with Sandals’ signature private butler service. Special surprises, superb service, and a view to die for? Sandals Royal Caribbean luxury resort knows how to make your all inclusive adults only honeymoon a blast! 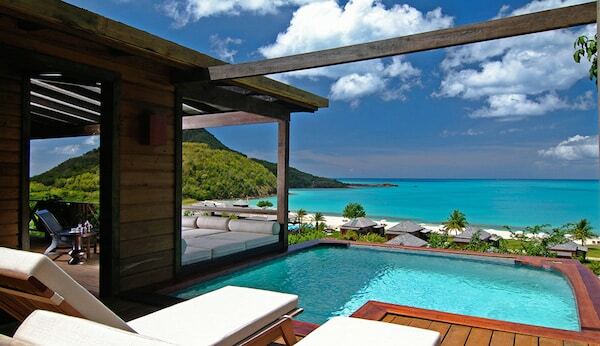 The Hermitage Bay resort in Antigua is one of our top picks for Caribbean honeymoons! This five-star boutique hotel just exudes elegance. And with only 27 suites, it’s the perfect honeymoon escape for couples that crave an intimate feel while still enjoying the ease of an all inclusive. for meals that are as refreshing as the island’s breezes. Plus, Hermitage Bay in Antigua, where the resort is nestled, has a fascinating geography. You can spend the day exploring the lush green hills that surround the resort and then come back to lounge on the white sand beaches of the Hermitage’s tranquil cove. We love Excellence Playa Mujeres in Mexico for a world-class honeymoon experience. We’ll let this be our little “secret” … Secrets Maroma Beach is one of the top luxury all inclusives in the popular Cancun region. This is the spot to stay at if you’re looking for a fun, grown-up experience for your honeymoon — think unlimited top-shelf liquors and a pulsing nightlife scene. 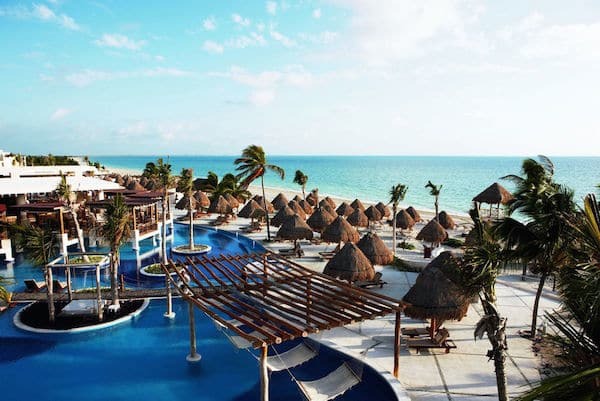 The Secrets Maroma Beach resort also has free wifi, not a given at a lot of tropical resorts, which means you can post plenty of sun-drenched selfies of your Mexico adventures as a wedded couple. And of course, the pristine golden sands of one of Mexico’s finest beaches just can’t be beat. Located right at the tip of the Riviera Maya in Mexico, Excellence Playa Mujeres sits on two miles of virgin white sand that become your playground. Escape to this all inclusive, adults only all inclusive resort for a taste of true luxury. Charter a boat at the marina near the resort (it’s within walking distance), or book a tee time at the nearby Greg Norman-designed golf course, replete with stunning ocean views. If you’re considering not just a honeymoon, but a romantic destination wedding in Cancun, Excellence Playa Mujeres knows how to properly pamper any bride. Their exclusive bridal spa package ensures you’ll be looking your absolute blissful best on your big day. To ensure you and your beau get to enjoy the most stunning views at the property — we highly recommend that you start planning your honeymoon well in advance. Get in touch with our local travel agents in Augusta or let our online travel agency experts help you to build your dream honeymoon vacation at one of the best all inclusive adults only honeymoon resorts worldwide. We’ll be happy to guide you through the process. Truly Pamper Yourself: Let Our Travel Experts Build Your Own Honeymoon Vacation Now!